The carcass of a female tiger was found in a search operation by forest staff early on Monday. 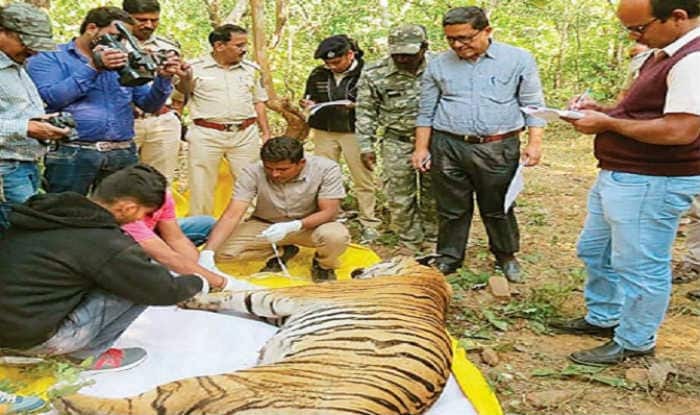 Chief Conservator of Forests and Field Director of the Pench tiger project Ravikiran Govekar said the female tiger’s carcass was found in a search operation by forest staff early on Monday. “The locality is close to the site where the dead male tiger was found,” he added. The tigress has been identified as T4. Carcasses of a wild pig and a common Indian civet were also found nearby. “In both the cases, it was observed that tigers had consumed the wild pig meat,” he added, stating that prima facie, it seemed that the pig carcass was poison-laced. The samples were collected for forensic testing to ascertain if the cause of death was poisoning. “The scene of crime is around 100 to 200 meters from agricultural fields,” said Govekar. The male tiger was found dead on Sunday morning in the Paoni range of the Umred Paoni Karhandla wildlife sanctuary near Nagpur. Sources said the carnivore, whose body was discovered by tourists, could have died of poisoning as it was found to have vomited, had froth around its mouth and its stomach was bloated. The tiger may be the offspring of Maharashtra’s iconic tiger Jai who went missing from the tiger habitat in 2015. The Umred-Pauni-Karhandla Wildlife Sanctuary is spread across Nagpur and Bhandara districts of Maharashtra. The state has nearly half-a-dozen tiger reserves and prominent among them are Pench, Melghat, Tadoba-Andhari and Sahyadri. There are nearly 165 striped cats inhabiting these reserves.